YUP! It's been a busy week of hanging out with kids here in Brooklyn! On Thursday I was at the Brooklyn New School! And on Friday I hung out at the Fort Greene Co-Op School! That's a lot of Kindergartner and First Graders to read 1000 TIMES NO to! And you know what all those kids had in common? Be they from Brooklyn or elsewhere? 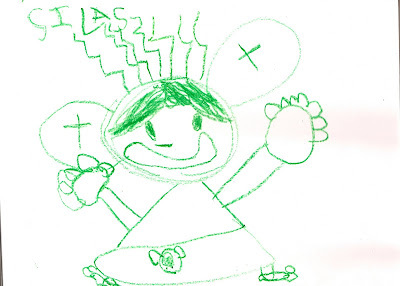 THEY ALL DRAW BETTER THAN ME! But boy were they fun! Sooper giant thanks to ALL the kids for making the readings such a blast! And extra special thanks for the sooper hospitality of the teachers and librarians who took good care of me while I was visiting! Next week I'll be venturing out of Brooklyn to visit Washington Elementary School in Nutley, NJ and Afton Elementary in Yardley, PA! I hope they can't draw out there! It's only been a couple weeks and it feels like every day someone else has something nice to say about 1000 Times No! 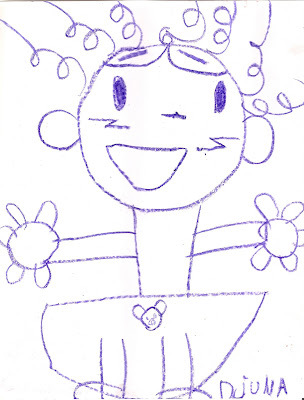 "Kids will dig the theme and the brightly colored, thick-lined art. 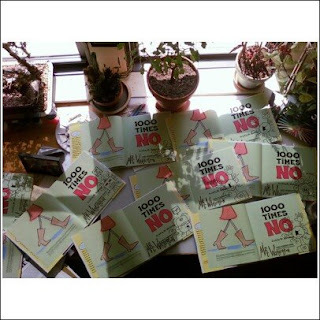 Adults will have fun reading the various incarnations of "No" (and some may feel desirous of the mom's awesome boots)." "Also, as he spouts his endless monologue of the negative, he is often accompanied by a blankie with the head of a chicken. A rooster, to be exact. Upon closer inspection it may even be a four-legged octopus with a fowl head. Whatever it is, it makes one thing very clear: chickens are funny. And chicken blankets? Even funnier." "Like an opposite of Don't Let the Pigeon Drive the Bus (now YOU are the one being told "no") it shares with that book a memorable plot device. 1,000 Times No = 1,000 Times You Betcha." OR you can go to the book's page on AMAZON.COM where she's posted it as well! And while you're there... why don't YOU post a heartfelt, love letter-like review yourself? Use lots of big words like 'awesomariffic' and 'betterthanstarwars' for extra points! The Amazon people love that. And so do I! "Mr. W worked for me, directing episodes of my Cartoon Network series Sheep in the Big City. Then, my show was canceled. Then, his Cartoon Network series Codename: Kids Next Door replaced it. Then, he made me work for him writing away in an elevator shaft for four whole seasons! But, I escaped to make books! Ha! But now... he's making books. Wait a second, before I know it I'll be back in the elevator shaft! Too bad the book looks so good and so funny"
RATS! My grand scheme revealed! 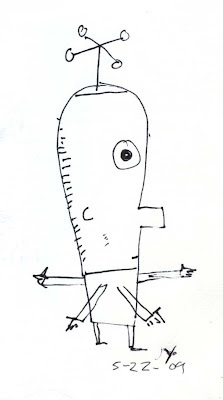 Check out the rest of Mo's sooper nice plug over HERE! Oh, and the animated promo for 1000 Times No up on Youtube? Coming up on 6000 views already? Want a couple more yummy reviews? How about THIS one? Or THIS one? And don't forget THIS one! And rumour has it we're getting a write up in Parents magazine next month, too. Sooper massive aircraft carrier-sized to all those who showed up for the big Books of Wonder event last Saturday! It went great, although a lot of folks were late and missed my big, emphatic reading that the critics raved about ("LOUD LOUD LOUD! 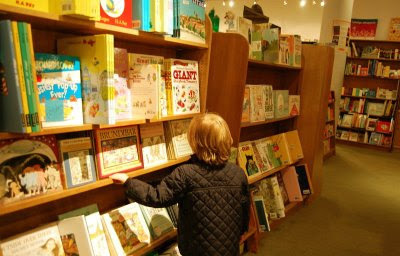 ", Loud People Magazine and "The SECOND best reading of 1000 Times No on a Saturday, May 23rd at Books of Wonder EVER! ", some guy who was in the wrong bookstore). And not only was I fabulous, so were the other authors! A great group of talented people and a pleasure to chat with. Of course, I tackled each and every one of them and made them draw in my sketchbook! 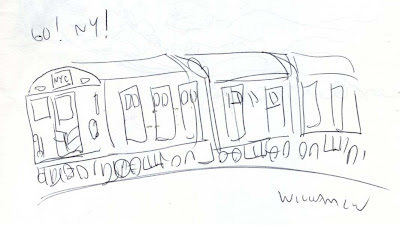 Unfortunately, Lynn Curlee (Trains) couldn't make it to the event... possibly because he didn't want to draw in my sketchbook? I'll have to ask him if I ever meet him. So what's next? A TON of school visits here in Brooklyn including the Dillon Center in Fort Greene, The Brooklyn New School, and The Fort Greene Co-Op School! Not to mention, this Saturday June 6th, a visit to sooper hip children's store MINI-JAKE in Williamsburg, Brooklyn! But more on that later! 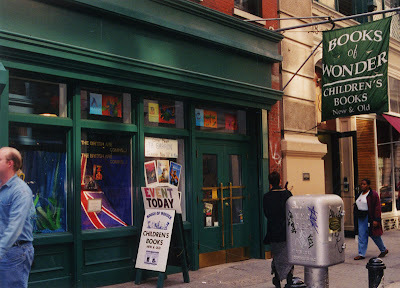 I'd have to say that pretty much every artist in NYC knows Books of Wonder-- the, the, THE premiere children's book store in all of NYC. It's a veritable mecca of inspiration, awe, and amazement. A place to stop when you need that jump start of creativity or a place to find the perfect gift for ANYONE, be it yourself, a child, an adult or fellow creative person. And this weekend, Saturday May 23rd from 12:00-2:00 it's my turn (sans beard) to take the stage to read 1000 Times No. But I'm not going at it alone. I'll be there with 5 other awesome authors, like Chris Raschka (Charlie Parker Played Be-Bop is a favorite around Warburton Secret Headquarters), James Yang (Puzzlehead), William Low (Machines Go To Work), Lynn Curlee (Trains), and Valeri Gorbachev (The Missing Chick). Even if you don't like me or my book (as IF...), you're virtually guaranteed to like one of these authors and their work! 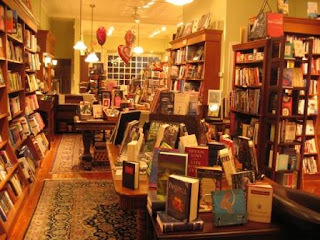 So come on into Manhattan this Saturday at noon and stop by the coolest book store in town! All the information you need is right HERE! I SOOPER HEART GREAT REVIEWS! Animation and children’s books share a long history together. 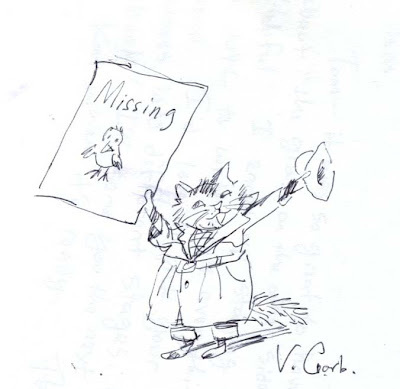 (See the brilliant Bill Peet, for instance.) 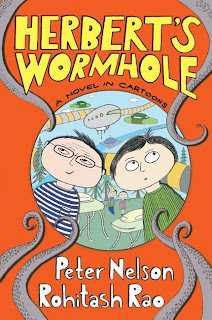 I’m always intrigued when I see a new children’s book written and/or illustrated by someone from the animation industry, mostly because I am an animator. Add the illustration degree and a big collection of vintage children’s books to the mix and, well, you get my point. So, when I was handed a copy of Mr. Warburton’s 1000 Times No (from Harpercollins) the other day, my interest was keenly piqued because I knew that this “Mr. Warburton” was none other than Tom Warburton, creator of Cartoon Network’s Codename: Kids Next Door fame. 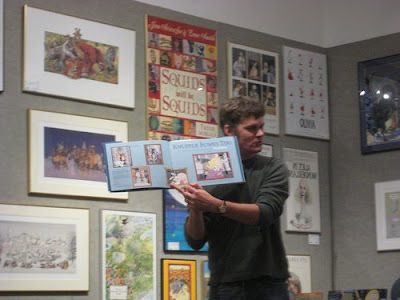 Tom’s also been involved with other productions, some with fellow NY animator-turned-famous-children’s-book-author Mo Willams. It was through a suggestion by Mo that Tom should do a children’s book. “1000 Times No” ended up being his first endeavor. The book is illustrated in Warburton’s signature KND style, which young readers will thoroughly enjoy. 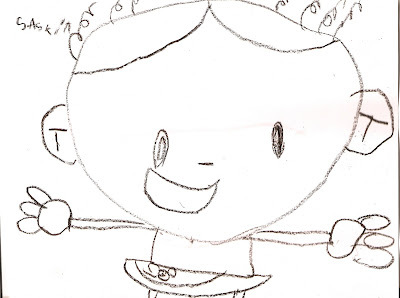 My kids (8 and 4 years) also enjoyed the simplistic story, of which a toddler, Noah (get it? Noah?) has been told that it’s time to leave by his mother, but instead tells her off with a wide variety of NO’s. 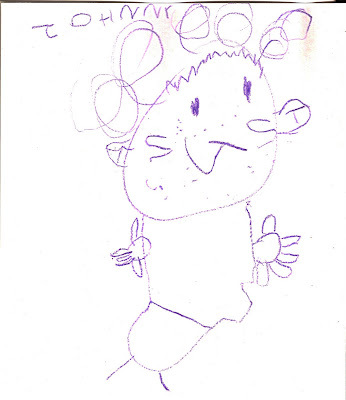 In fact, it’s through all the multiple versions of saying “no” where my kids got a big kick out of the book. Seeing “no” written out in Dutch, Greek, Japanese, Inuit, Latin, even Zulu, among other inventive (and surprising) ways, was quite entertaining. I was on the desk in the children's department earlier tonight, and a lady had a baby and a little girl. When she got the call from her husband: "Come on home, dinner's almost ready," the baby started fussing and the little girl lost it. "NO!" she wailed. My kids are 20 months apart, and boy I remember that sinking feeling when you realize just how far it is to the exit, and how long your walk of shame will be, escorting not one but two shrieking bundles of raw nerves. But when the mom saw the title, she cracked up. Me too, I have to say. Noah doesn't want to leave when mom (wearing very sassy boots, I note appreciatively) says it's time. On each page he communicates "NO!" in a different way - via text message and tin can telephone, in Mongolian, Zulu, Tagalog and Robot, through heiroglyphics and by means of a vigorous head-shake. Noah is accessorized or contextualized appropriately for each utterance, until, on one page, a thousand Noahs sit in the seats of a boisterous U.N., all voicing their disapproval. Endpaper bonus: Noah a thousand times (not really), in all his different hats. Organic milk came shooting out of my nose when I read this book. How many ways can a diaper-wearing tot with curly-Q hair say “No”? Well, at least a thousand ways. But, here’s the dilemma—if we read this book to a tot, will it give them more tricks in their well-stocked arsenal of evasion tactics? Will your tot start saying no in foreign languages including pig latin? Well, it’s worth the risk of reading this fun frolic through the land of no. It is most definitely a tale of a universal parenting experience, so we give it one big YES. Mr. W ON THE 10 SHOW! No human being could survive it all! At least that's what someone without sooper powers would say. I can handle it. Even after getting in at 5:30am from Los Angeles this morning. So let's DO THIS, PARTY PEOPLE! First stop... the Curious Pictures Book Party tonight, which is gonna rock pretty hard. Then I gotta be in Philadelphia on May 15th, Friday morning at 8:30am for a LIVE appearance on the NBC 10 morning show to talk about 1000 Times No! Awesome, right? Let's just hope I don't have a booger sticking out of my nose LIVE and on the air, okay? 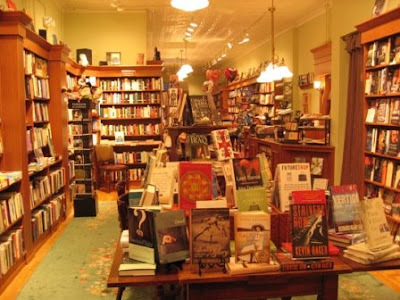 And then on Saturday at 2:00 I'll be a readin' and a signin' at Head House Books. If you live nearby, I hope you can make it out to say HEY! ALL the info you need is HERE! By now, mere mortals would collapse and die. 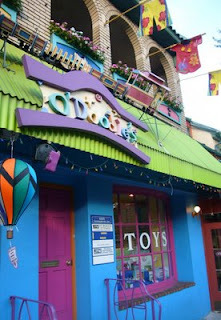 How about O'Doodles Toy Store in beautiful Chestnut Hill, Philadelphia? They're having their annual Home and Garden Festival so I'll be outside the store reading, signing and drawing pictures on Sunday, May 17th from 1:00 until who knows when! But it doesn't stop there, ya'll. 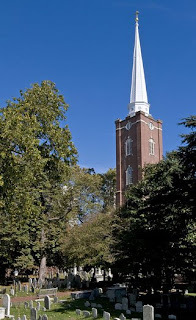 On Monday the 18th I'll be stopping by St. Peter's School for their annual book festival to rock and read! AND rumour has I might be stopping by the Independence Charter School on the SAME DAY to squeeze in some more action?! And maybe some more TV appearances along the way? But I'm ready, willin', and rockin'. ... a million books for the party! 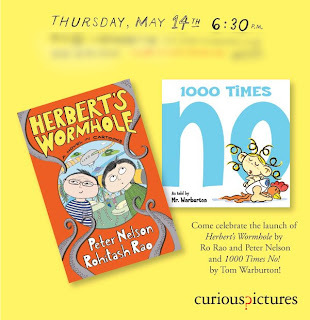 Curious Pictures is throwing a book party for me and Ro next week! Like, as in sooper commercial director Rohitash Rao? Yeah, that guy. He's got a book just out from Harpercollins too! And also check out the awesome website he and his writing partner made for it HERE! So, yeah... Curious is throwing a book party for us! I'd love to invite everyone in the world, but it's kinda small and only for those involved with the whole process of getting these books out there. But I'll make sure to post some pics after it goes down! There are just TOO MANY things worth posting about lately. And when they called me a 'driving force in the animation scene' it does NOT mean I'm a chauffeur. At least not to animators. So what else? How about the fact that 1000 Times No's animated promo has almost 2300 hits on Youtube as I type this! It's no bird dancing to Stevie Nicks... but I'll take it! Spread the word and tell your friends to watch it over HERE! Why so many views already? 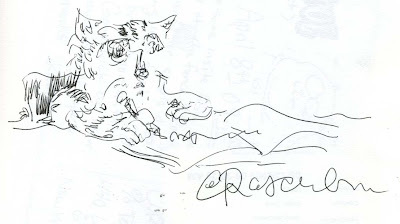 Because of the wonderfully wonderful wonderfullness of folks like Jerry Beck at Cartoon Brew and Fuse #8 at the Library School Journal and Joe Murray (of the Rocko and Camp Lazlo Murrays), that's why! And I love 'em for it. Oh, and I'm going to LA next week. 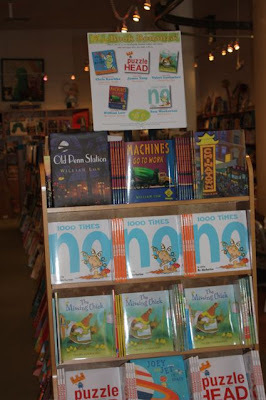 1000 Times No at Head House Books in Phila. The events for 1000 Times No are piling up! And the next BIG one is down in Philadelphia-- my hometown! 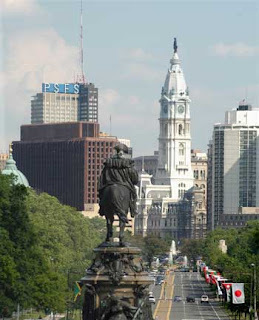 Although, technically, I'm from the suburbs of Philly... but I spent enough time in the city proper that I can feasibly call it my hometown! I mean, hey... I still root for the Flyers even though I live in NYC! Anyway... on Saturday the 16th at 2:00, the wonderful people at Head House Books have invited me to come read and sign 1000 Times No, as well as teach the kids how to draw Noah! Fun is absolutely guaranteed or your money back! (and you can get them HERE!). So all you friends, family, KND fans, and Philly fanatics come on down and say HEY! 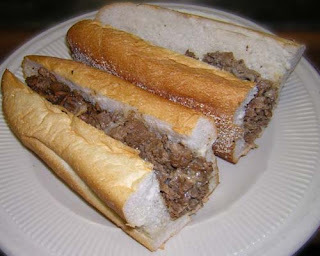 And make sure to tell me if I have cheese steak stuck in my teeth when I'm reading, okay? Brownstone Books in Bed-Stuy, Brooklyn RULES! I should know, since I just got back from my VERY FIRST book store visit there. all the way from Long Island! So after Ms. Carol J got the crowd warmed up with an awesome reading of Shel Silverstein's The Giving Tree, it was time for me to read 1000 TIMES NO! And read it I did, to a bunch of awesome listeners! And then, of course, there was a whole lot of book signing! Sorry to those who didn't get a copy-- but if you ordered one, I'll stop back at the store to sign it once it comes in! But hey, running out of books means people are buying them, so that's a GOOD THING! Sooper triple huge thanks to all that came out and massive thanks to Brownstone Books for having me. Don't be shy to stop in and visit 'em if you get a chance! Oh... and did I mention there were cupcakes?